I tried the one for the license plate light but the draw is too heavy and causes the can bus to throw a fault. Can anyone identify any others? I very much doubt you'll find one, as the canbus will be doing its job wherever you tap in. Most guys incorporate a separate fuse block (PDM 60 for me), and run independent circuits, each fully controllable. There are many types available. Found that switched source that everyone needs! it is Blue with red tracer right next to the Dynamic suspension pump under the seat. Nice 14 gauge switched power. Admore Light Bar. The tail light on this bike is pathetic! I'm about ready to install a PDM60. What did you use for the switched power source? 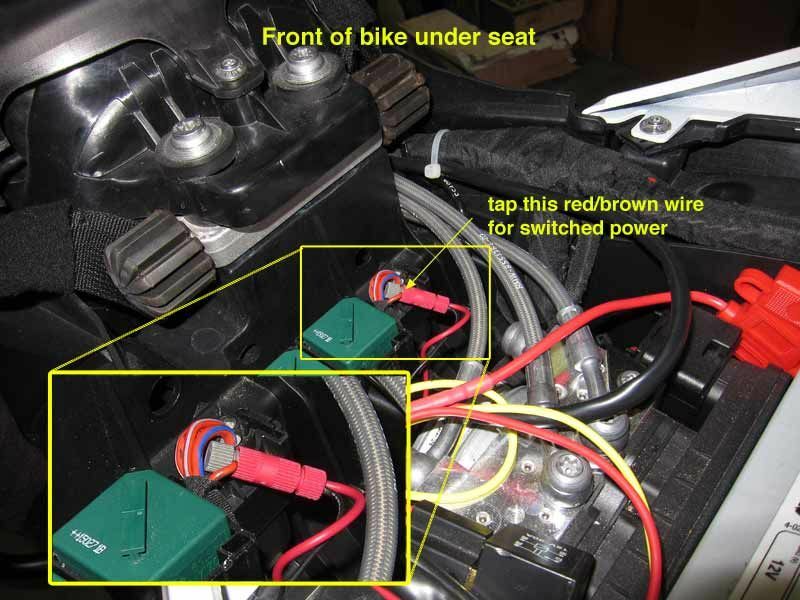 For switched power at the rear of the bike we recommend the red/brown wire under the front of the seat ( see photo). This provides enough power to run our lights, and probably other brands as well. If you need more current, simply have the license plate light wire turn on a relay. Inexpensive relays, with their own fuse, are available on Amazon or elsewhere. This will also avoid the 30 second delayed-off on the red/brown wire. Thank you. Can you tell me what that wire is for?